Home » Blogging Tips » What are the ways to get comments on blog? What are the ways to get comments on blog? Hi readers, I want to ask you one question. If there is no comments on your blog, is it really consider as a blog? Most of the readers give the answer as “No”. Yes it is correct. If you are a blogger and blogging for more than four months or even a year, posting subsequent articles and not getting any comments, and then we can surely say that, your work is not good. Just, we have to think that, if a blog is not getting any comments from readers, then it may be due to, not encouraging your readers and you are not properly engaged in response to the readers. Up to one or two weeks, my blog post never got comments from the readers. Here, I got more comments for some post and few for some post. But I wanted to get more and more comments from new visitors and from regular readers of my blog. So I decided to do some simple things to increase comments on my blog. I want to list out the things that helps me to get lot of comments for my blog. Blogging is about sharing ideas with others (your readers) and getting great ideas from others. After getting ideas from others, it’s our responsibility to respond them. At the end of your post, always ask the readers to share their ideas about the article. Ask them to share their stories, fun, experience etc… Post the wordings like, “Please make a comment, if you like this article and Share it, if you love this article”. Don’t feel shy or irrelevant to ask the comment from readers. It means that, try to read others blog and made an effective comment for their post. You don’t need to just comment on others blog, you have to read the post of others and encourage them by dropping a comment. If you do comment on other blogs, your blog will get engaged. Here you have to understand the seriousness of making comments to others. You are having a blog, which is not having proper comments, and then what will you do? Like yours blog, more number of bloggers expecting comments for their blog. In the mean time, if you made a comment, you will surely get backlinks and better response for your post. Make a comfortable circumstance for your reader as much as possible to leave a comment in your blog. 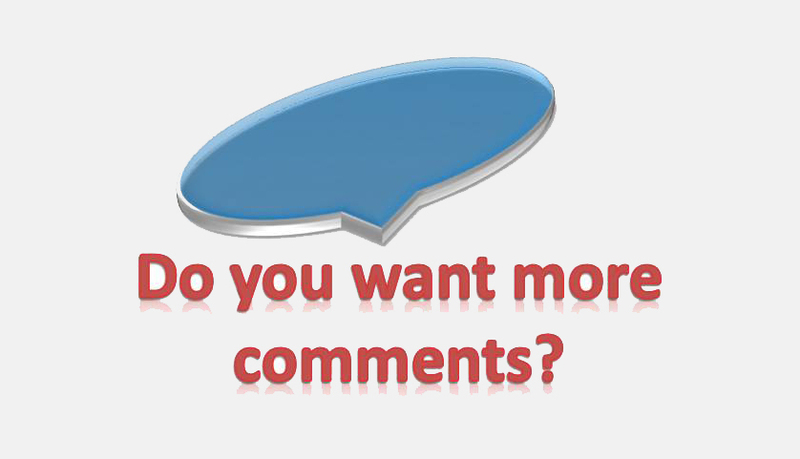 If you are using wordpress, then install “Comment Luv” plugin for better response from reader. Also add GASP plugin after installing comment luv. This plugin helps the reader to link (Backlinks) their website. If you are using free web services like, blogger, webstarts etc, better you can add plugin from disqus. It’s also providing an opportunity to earn money. If the comment section is easy to use, you can get more comments from your readers. Be loyal to response your readers. If a reader made a comment on your post, then it is your job to give correct reply to them. If you are lazy to read a comment of your blog, then why would your readers want to read your post? Don’t be absent to interact with your blog readers. Your reply is very important to the readers. It gives a positive impression to your readers that you are always active. Keep in mind that, don’t ignore to reply your readers. There are many ways to encourage your readers. Place a “Top Commentator” section in your blog for encouraging the readers who is always active in your blog. Make a reward for good commentators. Highlight the best commentator of month or weak to encourage them. By doing this, other readers try to do more comments on your post. Pay great attention to the regular blog viewers who comments repeatedly. Visit the blog of all readers, who leave a comment on your blog and encourage them by posting comment on their blog. Don’t be a copycat; try to provide “Unique Content” for your readers. If you know about a topic clearly, then you can post it. Otherwise don’t publish your article. Before posting an article, think about the readers; don’t care about SEO, SMO, keyword research etc… When compared to readers, these tools are secondary. If you want more comments, you have to think about your readers before publishing an article. Create an article, if you feel good and interested. The important thing is, if your readers really get benefit from your blog, they will surely make comments. I think this article is surely helpful to you. Make a Comment if you like this article. If you think it will be helpful to others, Share this article. Thanks for your appreciation. Glad to see your guest post on my blog. Asking some questions from readers or their views gives really more comments. I apply this effective technique on my blog. Thanks. Yes Avnish. I am agree with you. That’s why i mentioned this technique here. Thanks for making a comment on my post. Keep on contributing. Yeah. Really A Effective Way To Get More Comments On Blog ! Thanks for your comment ajay. Thanks for your valuable comment charan. hope to see u again on comment section. You mentioned is as the 2nd point. This is the best way to get comment on our blog as I think. Yes i agree with you. Commenting on other blogs helps to get more backlinks as well as good relationship. hope to see u again. Commenting on other blogs is really a good way to get comments. I have used this method, and I would say that it really did work for me. Another thing that I feel is having a good and user friendly commenting system. I agree with you. By commenting on other’s blog, we can get more traffic, backlinks and comments. Thanks for reading this post & thanks for your valuable reply. Keep on contributing. Very nice tips sir… Thanks for sharing with us..
It’s been long time to see you here. Thanks for your appreciation victor. Keep on blogging. I completely agree with your tips in this post especially writing effectively and commenting on other blogs. Blogging is leaving in a community where members interact and communicate. Commenting is one key way to interact in blogging. A great welcome to my blog. Blogging is the process of sharing & getting ideas from others. It’s a mutual process, so interacting with others is the best way to gain knowledge, relationships and as well as money. Thanks for your valuable comment. Keep on reading my blog enstine. A well written post emphasising on the the value of comments. I believe that blogging is a two way communication which will remain incomplete without comments. Without comments, blogging will be nothing more than publishing, simply pushing the content in the black hole of Internet. I liked your idea about the sharing aspect of blogging. It is the comments on a blog that brings life to it and without comments, a blog seems to a lifeless entity. Thanks for sharing your deep insights and I hope that the world of blogging enriches itself with the real and thought provoking comments. Thanks for your valuable & interesting comment. Sorry for the late reply. keep on blogging. hope to see you again. getting comment on any blog is easy . When you setup your blog you will start getting comment . But that all are spam . means getting spam comment to blog is very easy but valuable comment is not easy like that . To get good comment to you blog you must write useful content . Thanks for your comment. Getting comments for a post is not an easy thing, we have to put some efforts to get comments. Good tips Nirmal. I also say blogging tribes and groups help as other bloggers comment on your blog. Also like your tip of asking them. Welcome to my blog. Sorry for the late reply. Am agree with you. Thanks for your valuable comment. A simple question within the post can do wonders in terms of comments and feedback you receive. Even something as simple as, “What is your opinion on this?” can lead to tons of comments that wouldn’t have previously happened. Call to actions are extremely effective, so I try to find a way to put one in almost all of my blog posts. Thanks for your appreciation. Keep on blogging. creating post knowledgable and asking for feedback are important part.Because people would like to share there view. You have shared good agenda. I agree with ur comment. Thanks for appreciation. Hope to see u again. Thanks for coming. An impressive share! I’ve just forwarded this onto a co-worker who had been conducting a little homework on this. And he in fact ordered me breakfast simply because I found it for him… lol. So let me reword this…. Thanks for the meal!! But yeah, thanx for spending some time to discuss this topic here on your web page. I read this article fully on the topic of the difference of latest and preceding technologies, it’s remarkable article. Your tips seem to be very effective. Asking the readers to post their views in the conclusion is a good idea. CommentLuv is also very effective! I always write in the end of the post that the audience’s comments encourage me to write more. This has encouraged the audience to comment more. I have also tried to make commenting as simple as possible. I also reply to each and every comment on my blog and if possible, on social media as well. I loved your idea of honoring or rewarding the top commentator. Will try it out soon!